Thomas J. Bowers, tenor, was born in Philadelphia, PA in 1823 to John, Sr. and Henrietta Bowers, both active in the community. Father John, Sr., made his living as a dealer in second hand clothing and was a founding member of the Pennsylvania Anti Slavery Society. Thomas received his early musical training from his older brother John, Jr., who taught him organ and piano. At the age of eighteen, Thomas took John’s place as the organist of St. Thomas African Episcopal Church in Philadelphia where John, Sr. was a deacon. 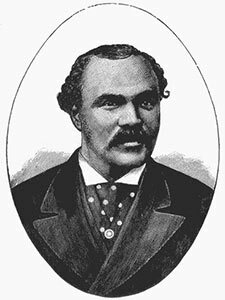 Trained as a tailor, he opened an upscale men’s wear shop with his brother John, while studying voice with the renowned Elizabeth Taylor Greenfield, appearing with Greenfield in recital at the Samson Street Hall in Philadelphia in 1854. Critics soon called him the “American Marion” and the “Colored Mario, “comparing him to Giovanni Matteo Mario, one of the most celebrated Italian tenors of the day. Under the management of Colonel J. H. Wood, Bowers toured the US and Canada. When he learned that a party of six blacks were not permitted to occupy the first class seats they had purchased for his Hamilton, Ontario, appearance, Bowers refused to perform. He established a policy of never performing before any segregated audience. “African American Concert Singers Before 1950” By Darryl Glenn Nettles Jefferson, NC: McFarland. ISBN 0786414677.